Music at Trinity hosts The Boston String Quartet on September 23rd, featuring a mix of fresh and original music from throughout the world. Program to include Zydeco, Blues, Fiddle, Folk, Gospel, Salsa, and Bossa Nova. The Boston String Quartet, who perform "mature depth and musical prowess" (Tower Records) have been delighting audiences throughout the nation with their unique blend of repertoire and performance style. 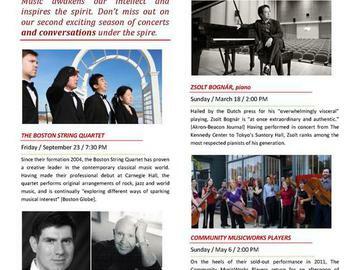 The Boston String Quartet has been a creative leader in contemporary classical music in New England. Having made their professional debut at Weil Recital Hall, Carnegie Hall, the quartet performs their own arrangements of classical chamber music, rock, jazz, world music and more, and is continually “exploring different ways of sparking musical interest” [Boston Globe]. This journey has allowed for collaboration with John Mayer, the Boston Ballet, Fionnuala Gill, Giorgia Fumanti, Jennifer Holliday, Lisa Fisher, Tim Janis, Dave Fiucznyski, as well as opportunity to perform sold out performances at such venues as Symphony Hall, the Los Angeles Music Awards, PBS, Yankee Homecoming Festival, and for former president George H.W. Bush. Committed to music education in New England, the members of the Boston String Quartet are currently Ensemble-in-Residence at contemporary music school, School of Groove. The quartet participates in multiple education tours each year, during which the group works with high school music programs in workshops, master classes, rehearsals, and performance.